I’m starting to feel normal again after such a crazy week, not sure having a day off for the holiday and a party to plan for in the middle of the week was as relaxing as it sounded with so much going on at work. After this work week, I spent most of yesterday in a funk trying to motivate myself to catch up with laundry and chores and not feel bogged down from work stress and financial stress as I work aggressively hard to save money this summer to meet a mortgage goal before replacing my car. That’s not easy when everyone else seems to be taking fun vacations and getting shiny new cars this summer! I have to keep reminding myself the interest savings will free up a lot of monthly funds so my aging economy car had better make it! But meeting my sister and mom at Baagan for lunch was a nice break for a little catch up and social time. 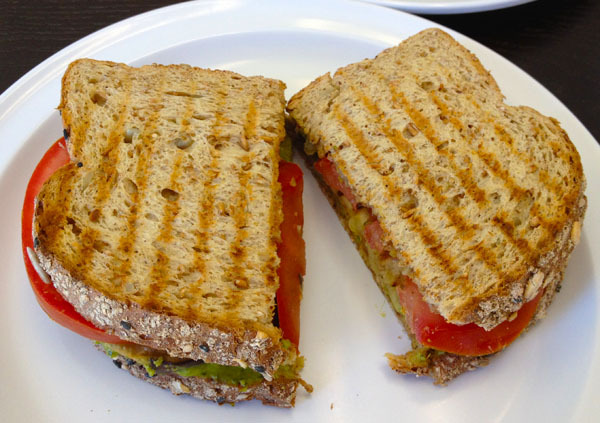 We all ended up getting the eggplant panini special that was fabulous with creamy tomato pesto and avocado tapenade. 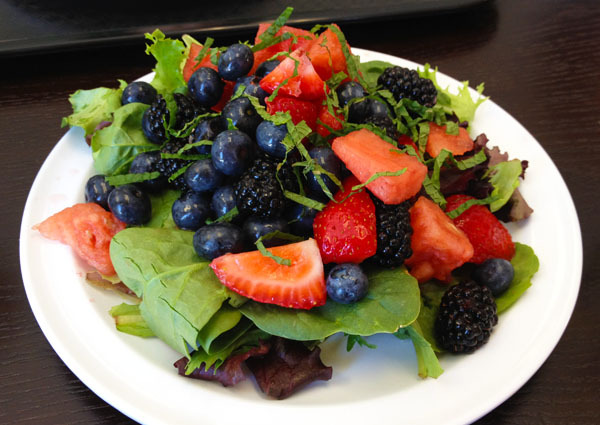 And complimented it with the berry watermelon mint salad that was just perfect in the hot and dry temps. After chatting for a bit and helping my mom sort through and clean out items before a move, it was back to reality with a trip to Target to load up on such boring items as toilet paper, laundry detergent, and hair products. 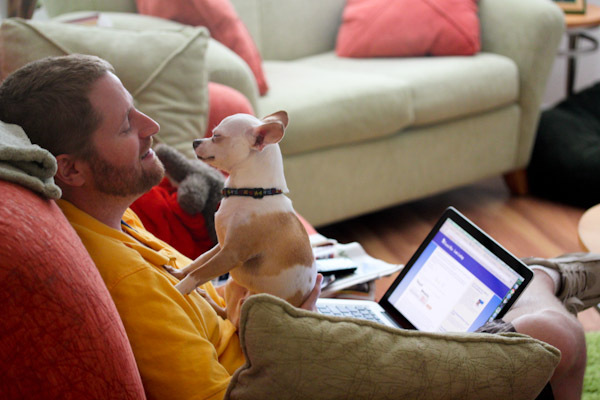 Then back home where Miko decided he was much more interesting then whatever hubby was researching online. 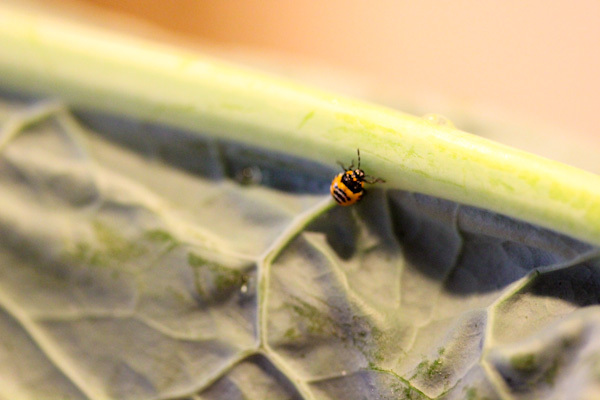 I headed out to the garden to grab some fresh kale for a salad and brought in some buggies it that I had to relocate back outside. 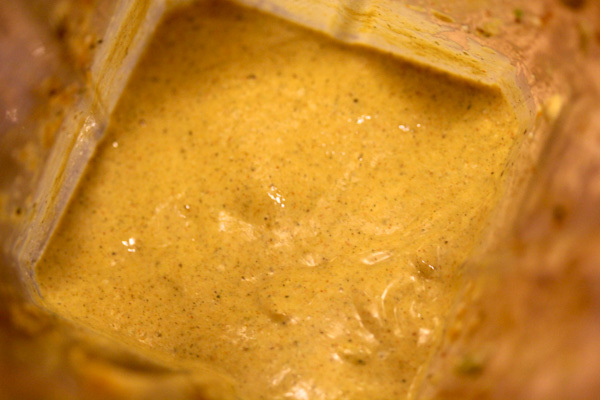 It made the perfect vehicle for a new dressing using a slack ingredient from Trader Joe’s – frozen mango chunks. 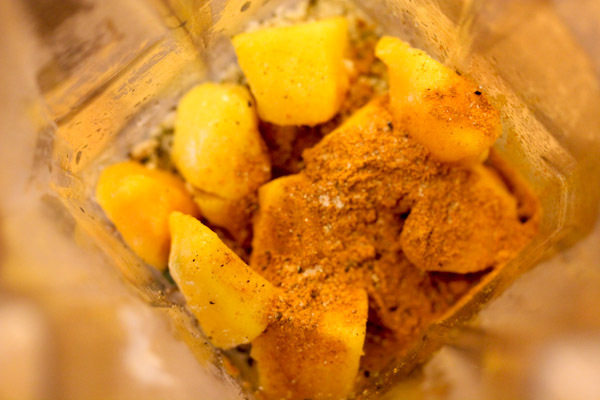 Place all ingredients into a blender and blend to a smooth and creamy texture. Makes about 4 servings. 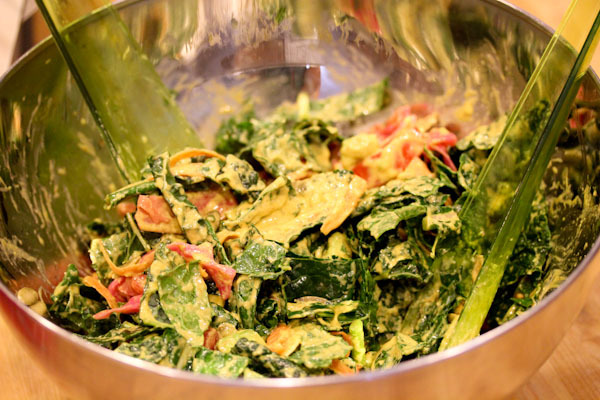 The dressing is very thick, creamy, and a vibrant shade of yellow thanks to the curry and mango. 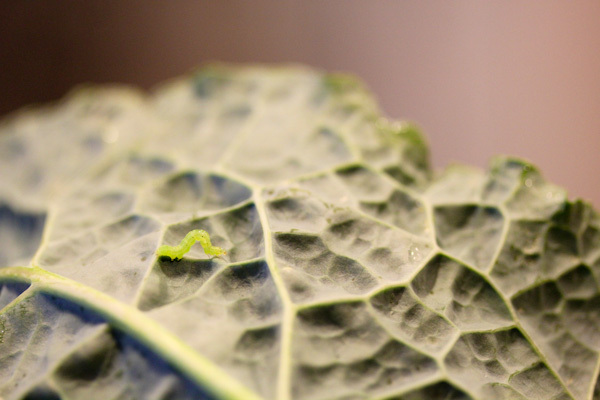 And it coats massaged kale leaves beautifully. The curry flavor is strong in this dressing which I like, but you can reduce the curry powder to 1 teaspoon for a little less kick. The slightly sweet and spicy flavors from this cool dressing make it a perfect summer addition to a colorful salad. 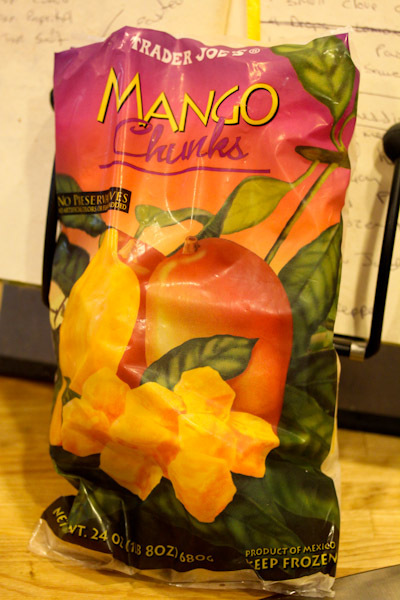 love frozen mango chunks – they are a staple & I used them in everything! your week and your stress…ugh. Well, bravo to you for staying disciplined and staying the course and realizing that your sacrifices now WILL pay off. I tell myself things like that when I am wondering why or what I am doing xyx thing for….then I realize, in time, it will pay off. 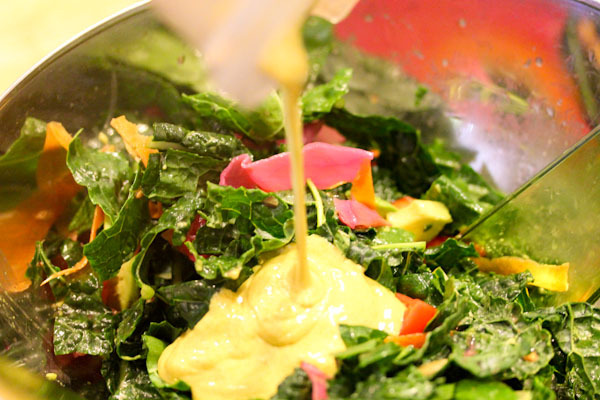 You’re so creative with your salad dressings! I always seem to make the same three over and over. I agree, the holiday in the middle of the week was odd and maybe not so relaxing-as much as I am grateful for *any* time off, it was very hard to relax and made the rest of the week even crazier. I hear you on the work stress and feeling frustrated with what seems like everyone having fun vacations and splurge spending-I always try to tell myself that it will all even out hopefully sooner rather than later! 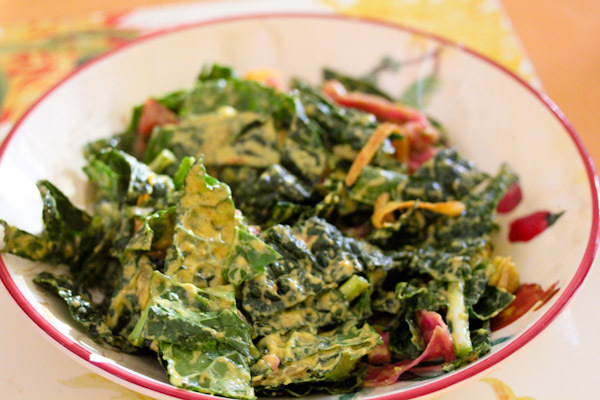 Thanks on the dressing, I have a few I make over and over too – like tonight’s recipe from Kristen Suzanne’s Hemp book. :-) And very true on vacations, I’m looking forward to a little time off soon and maybe a vacation once the financial goals are met. i hear you about the work stress! back to work for me today and i am trying to have a new attitude. you guys are smart to save money. do not worry…….the vacations and such will come later. trust me i could use some saving time too but i spent the money anyway! take each day as it comes……..sending good thoughts your way! This looks amazing! cant wait for mango to be in season (Australia). Thanks, it’s a good balances of spicy and sweet.